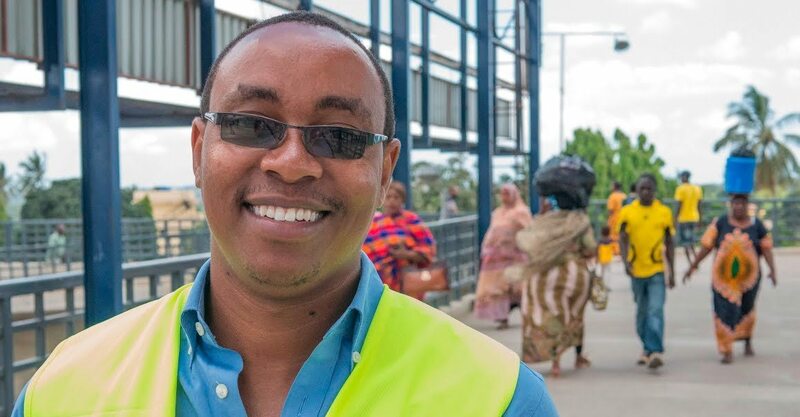 Engineer Ray Kileo is helping to transform the transport network of his home country of Tanzania, using skills he acquired while studying at Manchester University. Having grown up in the shadow of Mount Kilimanjaro, Ray graduated as a civil engineer from Dar es Salaam Institute of Technology in 2011. After being informed by a friend about Manchester’s Equity and Merit Scholarships, he successfully applied to study for an MSc in Construction Project Management at the university. The scholarship, funded by Mrs Josie Rowland, helped fund Ray’s fees for the year, as well as a bursary to cover his living costs. Upon completion of the course, Ray returned to the Tanzanian capital of Dar es Salaam to assist with the development of the growing city’s transport system. He is now managing the construction of Africa’s first-ever bus rapid transit system, ‘DART’ (Dar Rapid Transit). Inspired by similar systems in Latin America, DART is helping to make the city more accessible for its 4 million inhabitants, as well as improving journey times. Well done, Engineer Ray Klleo. As a very old Engineer, I am proud to have you as a fellow professional. What I forgot to add (I am an Old Engineer!) is that my own son studied an M Sc at Birmingham Uni (after his Civil Engineering first degree from Durham) -and I shared student accommodation (a flat in the early 60s) with three other civil Engineering students. It was seeing them struggling with heavy pieces of equipment, and looking perpetually muddy, cold and wet that convinced me that my future lay elsewhere in the very broad church witch in Engineering.